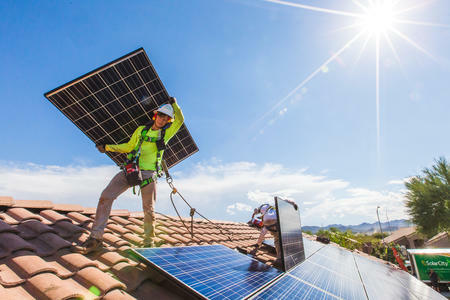 NRDC and SolarCity have published a new analysis on costs and benefits of rooftop solar energy in Nevada that shows it's benefitting all utility customers in the state and benefits could significantly increase under good solar policies. The results of the paper, coauthored by my colleague Dylan Sullivan, show that Nevada customers are already receiving $7 million - $14 million in net benefits per year from rooftop solar generation across the state -- which amounts to 1.6 cents to 3.4 cents in benefits from every net-metered kilowatt-hour -- whether they have solar photovoltaic panels on their roofs or not. The "solar wars" in Nevada have been heated, and as in many heated debates, reason is often the first victim. Advertisements on both sides have attempted to demonize the other: "Big Rooftop Solar" (a bit of a contradictory mouthful) vs. the "Big Utility" (apologies if neither of these epithets sound all that scary). Unfortunately, the interests of customers can get lost in this sort of atmosphere. This paper, entitled Distributed Energy Resources in Nevada, is intended to calm the debate, and add a measure of reason. This report shows that a policy that fairly compensates consumers for their production of clean distributed (onsite) energy and the excess they return to the grid serving all NV Energy customers has big benefits for all Nevadans. The full value of those benefits ought to be part of the discussion when it comes to setting utility rates for NV Energy customers. That's why this study includes a range of benefits not previously considered by the Public Utility Commission of Nevada, including: Cutting the amount of energy the electric utility needs to purchase and the number of new power lines that need to be built; and reducing fossil fuel power plant emissions and their health impacts. The new analysis from NRDC and SolarCity builds off the methodology and values from the previously commissioned E3 study, with the most recent and complete information available. The Brookings Institute also released a paper this week summarizing the findings of studies on the benefits of rooftop solar conducted across the country, concluding that "substantial evidence that net metering is more often than not a net benefit to the grid." When SolarCity approached us about authoring a joint paper on the costs and benefits of distributed renewable energy in Nevada, we were a bit apprehensive about entering the fray. We have supported moves by Nevada's principle utility, NV Energy, to clean up its system: closing one coal plant and divesting from another, proposing to end all coal use within the decade, and proposing significant new solar projects even through Nevada's broken renewable standard doesn't require it. We also support customer investments in clean energy, and utility rate designs -- such as net metering -- that compensate customers fairly. When a customer invests in rooftop solar, smart home energy management, or energy efficiency, those decisions do more than lower the customer's electricity bills. They also are tangible steps towards cleaning up the grid and addressing climate change fueled by emissions from fossil resources like coal and natural gas. If we are going to tackle the urgent threat of massive climate disruption, we need to unlock as many avenues to clean energy as possible- and people need to be able to partner with their energy provider to invest in clean energy and energy efficiency. In the end, NRDC decided to co-author this paper because we saw a need for a thorough analysis of the costs and benefits of rooftop solar generation in Nevada that could improve a contentious debate. NRDC views net metering as an effective, workable compromise to roughly compensate customers for their investments in clean energy. The exact costs and benefits vary by jurisdiction and rate structure, but overall it has worked remarkably well in Nevada and elsewhere. We don't view net metering -- or any rate structure -- as sacred. It is the fundamental job of utility commissions to develop fair rates that ensure utility grid investments can be adequately recovered. These investments are required to ensure reliability for all customers and should be made in the context of the urgent need to cut pollution and protect the stability of our planet's climate. This same rationale applies to consumer investments: As consumers choose to make cost-effective investments in helping to clean up the Nevada's electricity grid through rooftop solar, energy efficiency, or other clean energy investments, utility commissions should be considering how to adequately and fairly compensate them. As these thoughtful discussions take place, it is essential to look at the costs and benefits of rooftop solar in a measured way. The PUCN decision ending net metering in Nevada only considered a fraction of the benefits that rooftop solar provides -- and this paper provides a more comprehensive look. The Public Utilities Commission indicated that they needed more information about the costs and benefits of rooftop solar in order to make a decision about what rate structure should be in place to compensate consumers. Although their decision to move forward with dramatically reducing net metering rates without all the required information had negative consequences by disrupting the previously thriving solar industry, the commissioners stated they would consider the full scope of benefits in upcoming rate cases -- and we hope that providing a rigorous and comprehensive cost/benefit analysis will provide an opportunity for Nevada regulators and policy makers to make a fresh start on rooftop solar policy.